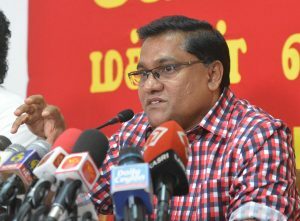 “Finance Minister Ravi Karunanayaka promises the IMF that budget deficit would be reduced. This is why Arjun Mahendran says initially tax income would be raised to 15% of GNP according to IMF proposals. Arjun Mahendran is Ranil Wickremesinghe’s consultant on economics. He, following the Minister of Finance, has said what the government intends doing. Also, Arjun Mahendran reveals, in a newspaper interview, that the government acts to make public enterprises profit making institutions and to keep the inflation in check. What they want to do by saying public enterprises would be made profit making institutions is to privatize state institutions. 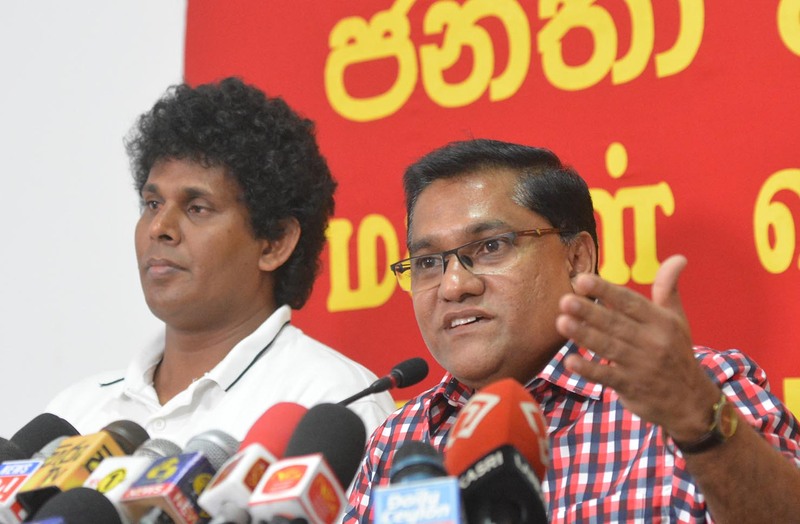 What they are doing now is fulfilling the promises the likes of Ravi Karunanayaka and Arjun Mahendran made to the IMF,” said the Information Secretary of the JVP Parliamentarian Vijitha Herath speaking at a media briefing held at the head office of the JVP at Pelawatta yesterday (11th). The Member of the Central Committee of the JVP Provincial Council Member Wasantha Samarasinghe too was present. Mr. Herath said, “The government brought VAT Bill before presenting the budget to add taxes for several sectors that were not taxed earlier. Patients who undergo ypass surgeries, surgeries for Neurovascular Diseases: have to pay Rs. 100,000 to Rs.150,000 more. The prices of tests including MRI scans went up. In such a situation the government added more taxes in the budget. Ravi Karunanayaka’s budget states the income in 2017 is Rs. 2049000 million and the expenditure is Rs. 3469000 million. The budget deficit is Rs. 1579000. As such, the government has to get a loan of Rs. 1579000 million to close the deficit. At present the loan interest is Rs. 680000 million. The loan installment is Rs.800000 million. Like Rajapaksa regime this administration too depends on loans. People were burdened with taxes by bringing in VAT Bill and more taxes have been added from the budget. The government expects to earn Rs. 390000 million from the new taxes that have been introduced. From this tax earning Rs.232000 million is to be earned from taxes levied on goods and services. The government has proposed to earn this money by taxing the goods and services consumed by 20 million people. This government doesn’t have a short term or long term programme to salvage the broken down economy. Like Rajapaksa regime its only solution is to get loans. Loans, taxes and fines are the only solution this government has to cover the budget deficit. Hence this budget is one full of loans, taxes and fines. The budget introduces several new taxes. One is airport tax. About 2 million of our people engaged in employment abroad are each taxed US$50 when they use the airport. A person has to pay Rs.7500 for each time he or she uses the airport. The government charges Rs.7500 from each of the thousands of people using the airport. Even those foreign employees who contribute a major portion of foreign exchange to the country are taxed. Also, a new carbon tax has been introduced for all vehicles. This is in addition to the emission tax that already exists. This government has also introduced several strange taxes. Ravi Karunanayaka says as courts have been burdened with a large number of cases, every case would be taxed. A person who has been assaulted will have to pay a tax in the hospital and if he wants to take legal action he will have to pay another tax. If the courts are burdened with cases what should be done is to make the process efficient. More judges could be appointed. Without doing this the government is levying taxes from the people who seek legal action. The result would be people who need to take legal action would refrain from doing so. People would not want to pay a tax to find their lost articles. This government always talks about digitalization; wi-fi zones. However, the government has increased internet charges by 25%. The government proposes to charge Rs.100 when a new zim is activated. The fee for money taken from ATM machines has been increased by Rs.5.00. With these taxes the government expects to earn Rs.390000 million. Also, the government has introduced new types of fines. The fine for a vehicle accident has been increased from Rs.2500. If a person is hospitalized due to an accident the relevant insurance company has to pay Rs.25,000 as hospital fees. Then the people will have to compulsorily pay for an insurance cover. The government attempts to deceive the people by reducing prices of several goods such as sugar by Rs.2.00, Rs.5.00 and Rs.10.00. Indirectly, a large amount of money is levied from the people as taxes. The loan interest relief given to senior citizens has been slashed. Also, there is a proposal to abolish pension for state employees. It has been proposed to abolish the pension and establish a contributory pension scheme from 2017. The facility of about 8 million private sector employees had to keep their contribution of the EPF fund as security and obtain housing loans has been completely stopped. This is a death blow on the innocent wish of private sector employees to build a house of their own. Despite Ravi Karunanayaka saying Samurdhi recipients would be given 5 kilos of rice, the move to recover the cost of this rice grant from the Samurthi grant given is not mentioned. It is a budget with such hidden motives. The budget also has proposals to slash health services provided by government hospitals. The government proposes to have paying wards in government hospitals. 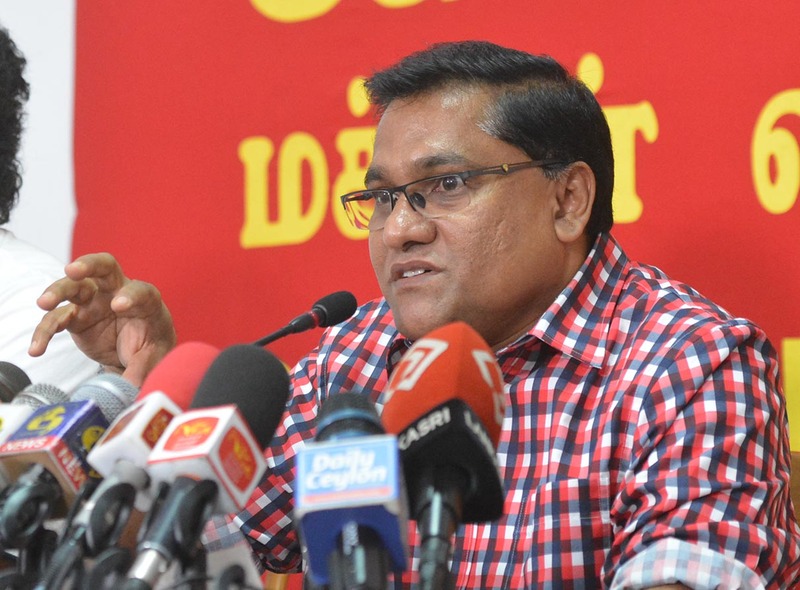 The government is scheming to have paying wards in districts such as Anuradhapura, Killinochchi and Hambanthota to abolish free health service. The health sector has been levied VAT through the VAT bill and now it is proposed to slash the health services through the budget. The total reduction proposed by the budget is Rs.67. When a Rs.100 phone card is reloaded the government levies nearly Rs.50 tax from it. The relief given by the government through the budget is recovered from one telephone call. The three wheeler, the vehicle of the poor, was taxed in 2016 budget and has been taxed again. The budget has slashed leasing facilities. While leasing for buses and lorries is 90% and vans and cars is 50%, the three wheelers get only 25%. At the election Ranil Wickremesinghe bragged that the economy they follow would allow those who own bicycles to become owners of motor cars. However, the leasing facility has been restricted to 50%. Many who buy vehicles make use of the leasing facility. This facility too has been restricted by this budget. The budget has slashed all the advantages the small man had. This government does not have a programme to get over the economic crisis that exists. The economy continues to be dragged towards a precipice. People are taxed for them to come out of the rut they themselves have created. People are being imprisoned in a debt trap. This budget has not been prepared by the government alone. Services have been slashed according to the orders from the IMF. Rs.174 billion that was allocated for health services last year has been brought down to Rs.160 billion this year. Last year Rs.185 billion was allocated for education. This year it has been reduced to Rs.76.9 billion – a reduction of 41%. Last year Rs.171 billion was allocated for higher education. This year it has been reduced to Rs.163 billion. While allocations for education are slashed, it is proposed to give ‘tabs’ to higher education students to conceal the reduction. The attempt is to conceal the reality by coming out with fairy tales. Finance Minister Ravi Karunanayaka promises the IMF that budget deficit would be reduced. This is why Arjun Mahendran says initially tax income would be raised to 15% of GNP according to IMF proposals. Arjun Mahendran is Ranil Wickremesinghe’s consultant on economics. He, following the Minister of Finance, has said what the government intends doing. Also, Arjun Mahendran reveals in a newspaper interview that the government acts to make public enterprises profit making institutions and to keep the inflation in check. What they want to do by saying public enterprises would be made profit making institutions is to privatize state institutions. What they are doing now is fulfilling the promises the likes of Ravi Karunanayaka and Arjun Mahendran made to the IMF.